Contenders for best score, part two! For Variety‘s second installment in our series on potential Oscar nominees in the music categories, I interviewed five composers, seven songwriters, a music supervisor and a director. Our main story features John Williams, in his first interview offering details of his new Star Wars score, as well as Hateful Eight music supervisor Mary Ramos talking about Ennio Morricone’s music; and The 33 director Patricia Riggen discussing the late James Horner’s contributions to her film. I also wrote four of the six composer profiles (on Thomas Newman, Michael Giacchino, Carter Burwell and Brian Tyler) and half of the song story (including interviews with Spectre singer-songwriter Sam Smith and The Hunting Ground songwriters Diane Warren and Lady Gaga). And there’s still more to come! 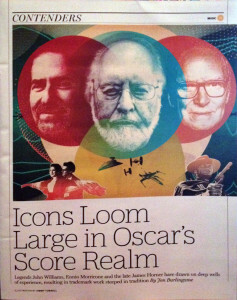 This entry was posted in Composers, Film Music, Interviews, Uncategorized and tagged Brian Tyler, Carter Burwell, Diane Warren, Ennio Morricone, James Horner, John Williams, Lady Gaga, Mary Ramos, Michael Giacchino, Patricia Riggen, Sam Smith, Spectre, Star Wars: The Force Awakens, The 33, The Hateful Eight, The Hunting Ground, Thomas Newman, Variety on December 9, 2015 by Jon Burlingame.